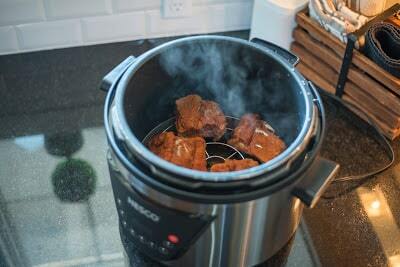 You haven’t had tender ribs until you’ve tried them in a NESCO Pressure Cooker. Enjoy our recipe for fall-off-the-bone-tenderness in under an hour. Optional, remove the membrane from the ribs – if you choose to remove the membrane from your ribs, take a butter knife to the back side of the rib. Work the knife between the membrane and the bone and grab with a paper towel and pull membrane off the ribs. 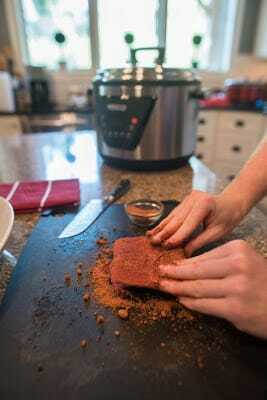 In a small bowl stir in the salt, paprika, brown sugar, chili powder and black pepper. Set aside. Season the ribs with the rub on both sides and cut the ribs into 4 pieces. 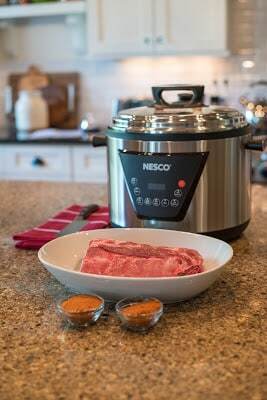 Pour 1 cup of water into your NESCO Pressure Cooker. Stack the ribs in bone side down. Lock your pressure cooker and cook on high for 30 minutes and then let the pressure come down naturally, about 15 more minutes. 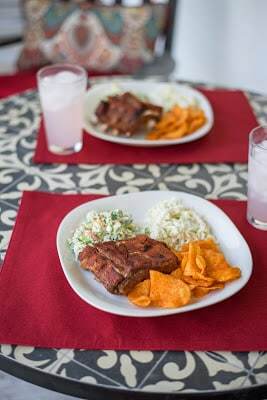 Put the ribs bone side down on a rimmed baking sheet. If you choose to, brush ribs with your favorite BBQ sauce. Put the ribs in the oven under the broiler on high. Broil for about 5 minutes or until the sauce is bubbling and just starting to brown. Remove the ribs from the oven, brush with another layer of sauce, and serve.